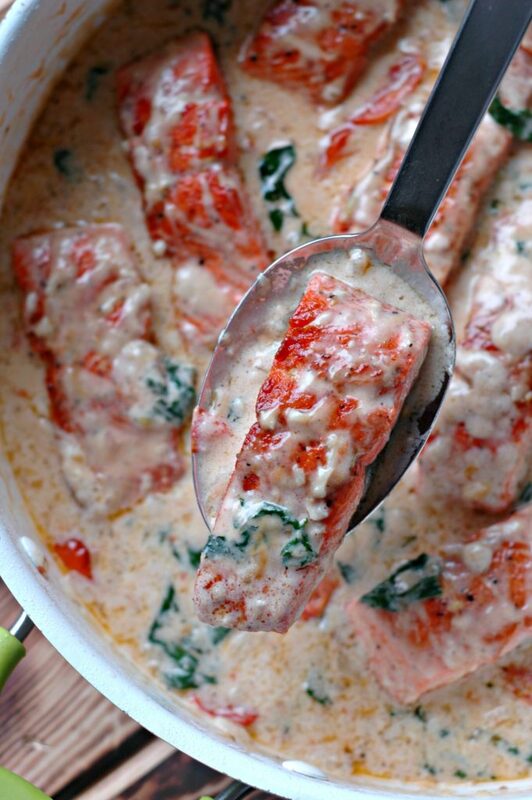 Creamy Garlic Butter Salmon :: Dairy Free Option Included! 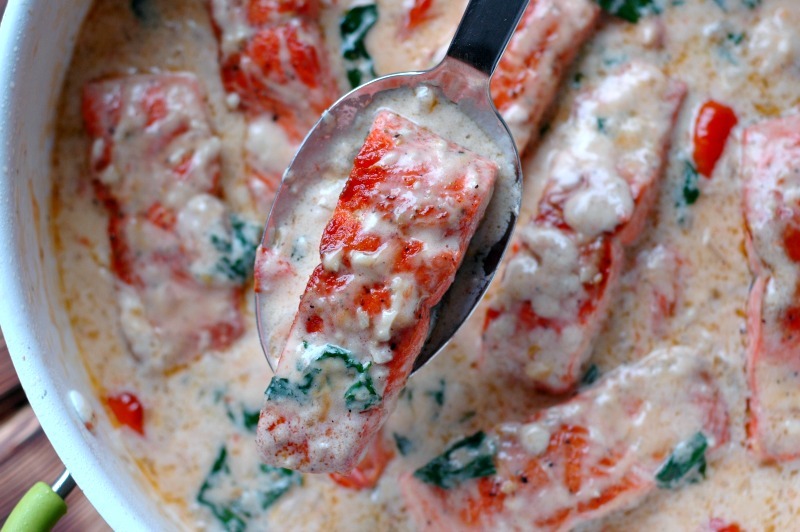 Gorgeous wild caught salmon drenched in an elegant, smooth, and creamy garlic butter sauce! A winter for the books! Six consecutive days snowed in from school, and 3 days of ice in a row cancelling school the following week. YOU GUYS…we are so accustomed to snow (and a lot of it!) 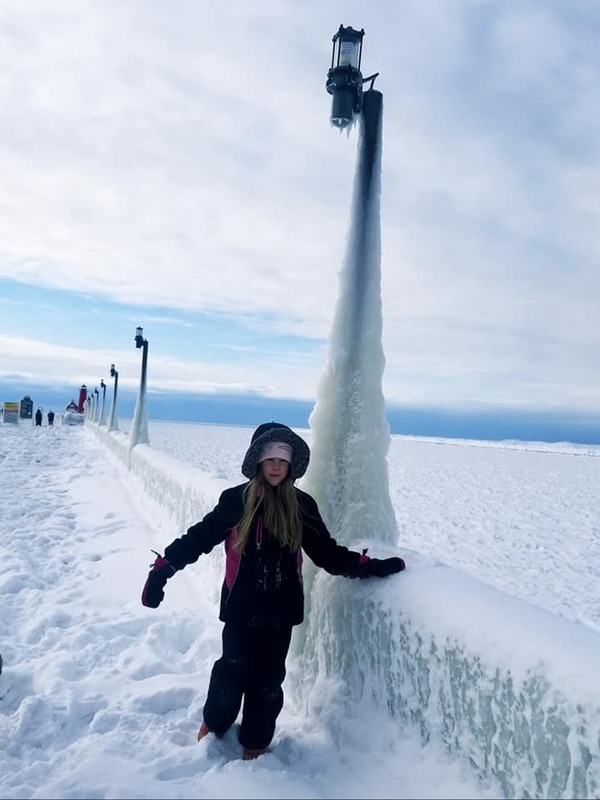 here on the Lake Michigan shoreline, and typically we can trudge through to school in just about any winter weather, but the last couple of weeks have truly made this a winter we will never forget! 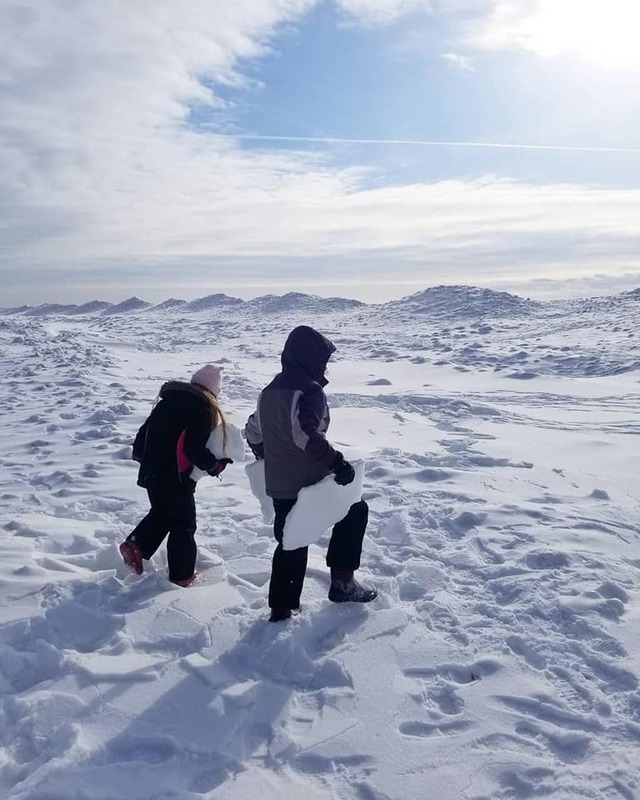 By that second ice day, there had been an accumulation of almost 2 weeks of fun school activities and dates canceled, and we were ready for some warm comfort food! My kids truly needed a brain boost to lift their spirits, and wild caught salmon always makes them smile. 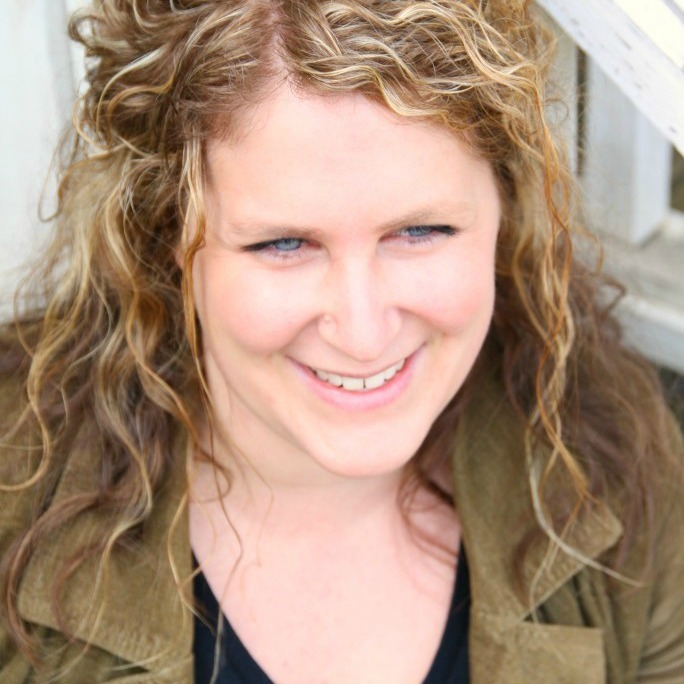 Easy weeknight prep for any occasion! 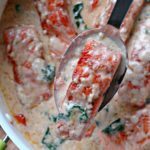 Whether you are snowed in, celebrating Valentine’s Day at home, or just have a house full of kids that need an omega 3 fatty fish boost in an amazing cream sauce, this salmon dinner is for you. The prep truly is weeknight fast for any busy work and school day, taking only 20 minutes to make! The elegant cream sauce would make any special dinner night at home perfect with pretty asparagus spears and glasses of white wine too. The magic lies in a super hot skillet, and I’m convinced ghee makes the best crust and flavor. Start by getting your ghee or other cooking fat super hot in the skillet and put the salmon that has been pat dry and seasoned with salt and pepper right in. After it has crisped up and sealed in the flavor on both sides, set the salmon aside to make the cream sauce. There is nothing like the flavor that comes from pan searing salmon, and all those bits from searing will cook right into the dreamy sauce. Creamy, dreamy sauce without the dairy! Unless you can tolerate dairy that is, of course! Because you can make it either way. Dairy free friends, I promise you won’t taste the coconut milk – there is so much amazing garlic goodness paired with ghee or olive oil, wine, and sweetly sautéed veg, that all you will taste is amazing flavor. 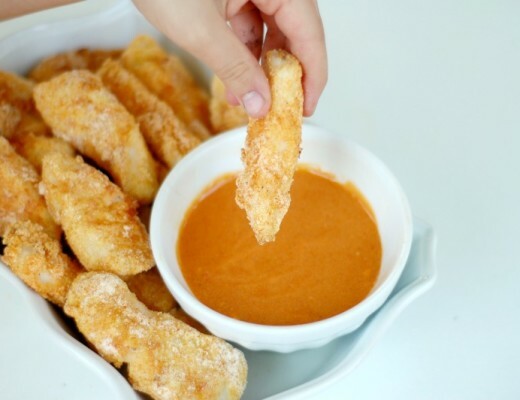 We thicken the sauce with tapioca which makes the velvety sauce so elegant and special – and trust me, I’ve had my fair share of gummy tapioca sauces – this is NOT one of them! It is so silky and amazing. If we hadn’t gotten iced in, I would have picked up some mushrooms to saute in with the onion and garlic – it is my favorite way to make this dish. You will love it! You can add some Parmesan cheese to the finished dish if you tolerate dairy ok! I have used sun-dried tomatoes versus fresh before, and it is SO good. And a great way to make this dish in the winter when fresh tomatoes can be pricey or not have that summer sweetness. You can add steamed broccoli to the finished dish for more veggie boost. Asparagus is my favorite veggie add in. During those first days of spring when the air is still cool and crisp, but the first of that spring asparagus is coming in, this warm salmon meal with asparagus is so comforting. 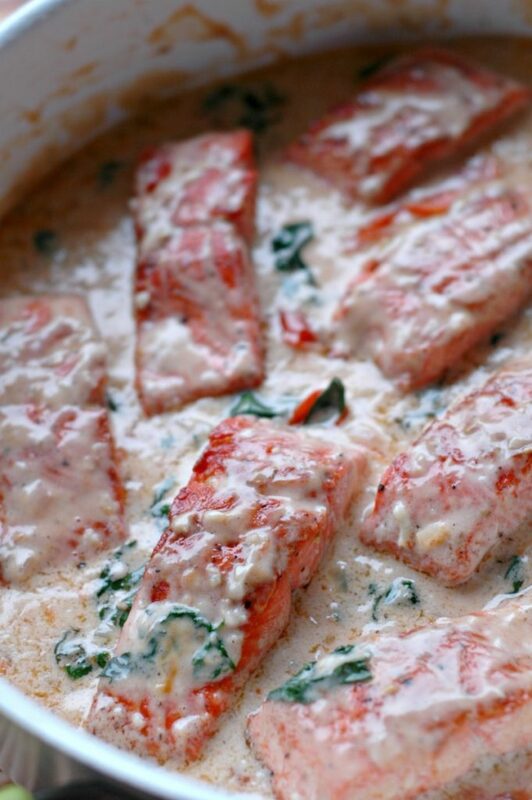 Creamy Garlic Butter Salmon with Dairy Free Option Included! Get your large skillet nice and hot and melt your ghee in the pan. 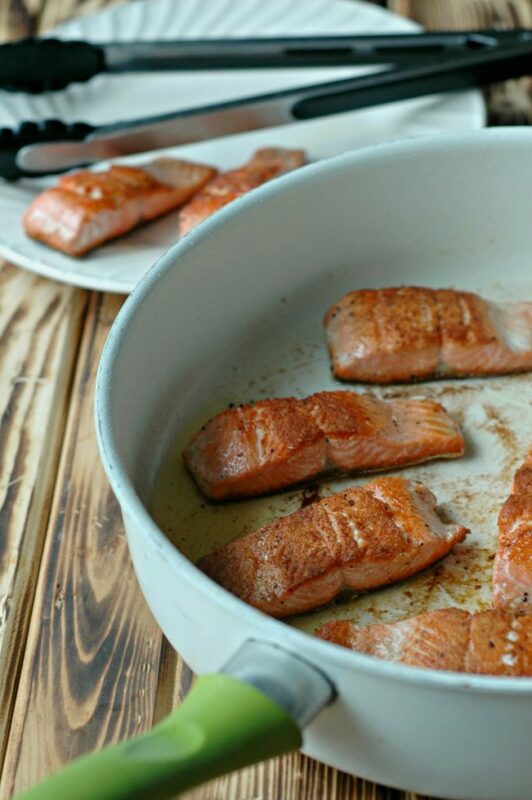 While the skillet is warming up, pat dry your salmon fillets and sprinkle both sides with sea salt and pepper. Put the salmon in the hot ghee, skin side down for 2-3 minutes until crispy, then flip the salmon over to the flesh side. Cook for another 3-4 minutes until the flesh has a golden brown crust. Take the salmon out of the pan and set aside on a plate while you make the sauce. 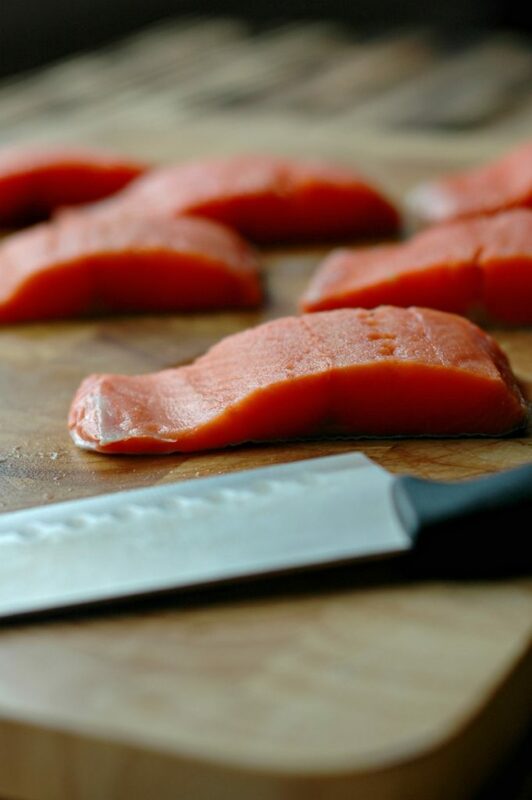 If your salmon is larger cut or thicker, you will want to bump up your cook time to more like 5 minutes each side. Melt the butter in your skillet over medium heat and add the onion and garlic. Mushrooms are a nice touch here too that we enjoy. Cook the onion and garlic in the butter for a few minutes until fragrant and starting to get golden brown. Add the wine and tomatoes and bring to a simmer for 4-5 minutes to blister the tomatoes a bit, and cook off the alcohol in the wine. Be sure to scrape up any bits at the bottom of the pan – flavor! Add the coconut milk and bring to a simmer over medium high heat for 3-5 minutes. Add the baby spinach or kale, along with the tapioca starch slurry to thicken the sauce more. Stir frequently until everything thickens – you can add more wine or water if you want to thin the sauce out any. Sea salt and pepper the sauce to your taste, and add the salmon fillets back into the pan to warm back up. Serve your salmon over white rice or rice noodles, over a baked sweet or white potato, or over a bed of steamed or roasted broccoli or cauliflower. What a dream!! So creamy, do decadent, ans delicious!! Well, this looks so special and delicious. I don’t often cook with white wine, but here I’d want to. 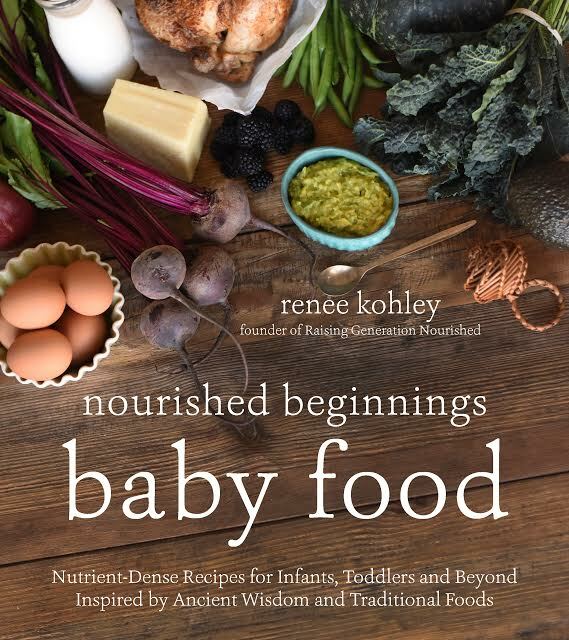 Thank you for this lovely recipe that I know my family will LOVE! 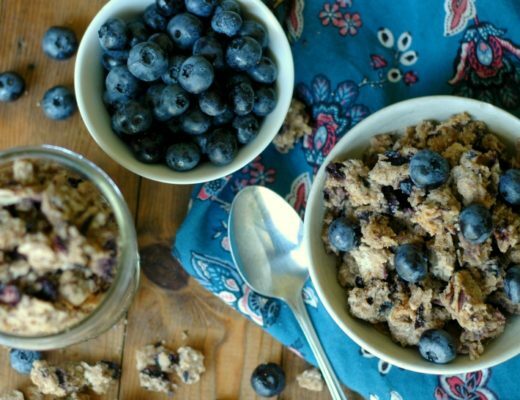 Swooning over this recipe! I’m so glad I can eat fish again, salmon has been my go-to lately! I love that pan-sauteed browned goodness on the salmon … and then it gets slathered in all of that glorious creamy garlicky sauce, WOW, so yummy! We love salmon and are always looking for new ways to prepare it — this looks fantastic! We’re on our 8th snow/ice/polar vortex school closure — feeling your pain! Woah, that color of the salmon I cannot get over it!! Just pinned this recipe because I am drooling over it!!! Mmmm… salmon and butter are such a perfect combo! I mean, how can you go wrong with a creamy garlic sauce? This looks fantastic! Love the addition of white wine. What a lovely way to enjoy salmon. Yum! Wow I can’t believe you have snowed in for that long…….looks beautiful but chilly! Love seafood dishes. 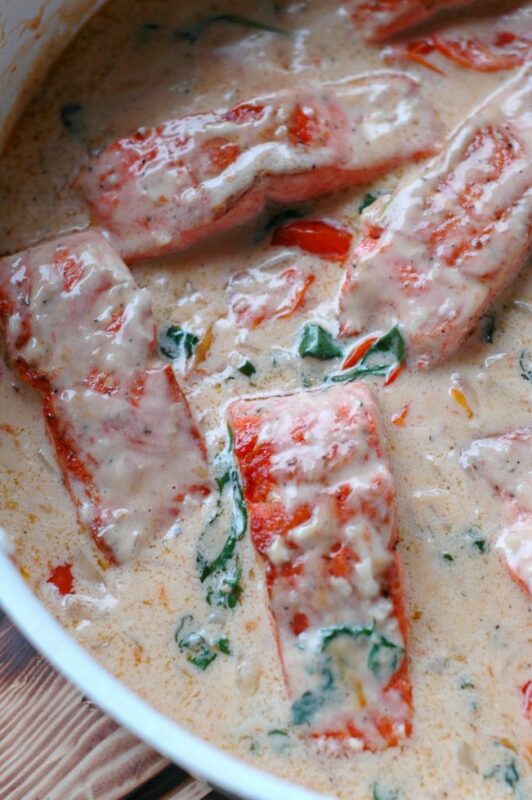 The salmon looks so moist and creamy delicious. A must-make! Do you think thawed wild-caught salmon would work here? I can’t get fresh high-quality salmon where I live so I always buy frozen. Thanks! I am usually all over it when I stumble upon a salmon recipe. But it is the creamy garlic sauce in your recipe that made me go “Yum!”. I can only imagine how well this sauce goes with the salmon and can’t wait to try it myself. Delicious recipe! This looks so rich and delicious! That looks really good! I have some wild-caught salmon in my freezer, I think I will make this soon! We’ve had a heck of a winter too in Toronto! The first snow day in 8 years! 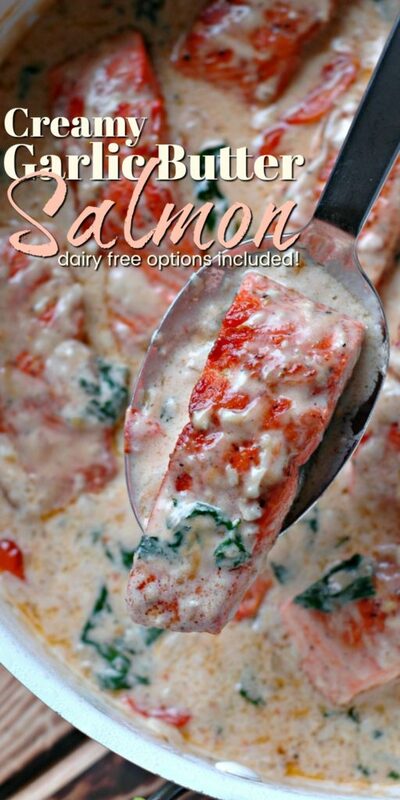 I adore salmon and this dairy-free sauce looks so delicious and perfect for cozy winter nights. This is pretty much just the ultimate comfort food, and so perfect for cold weather! I always crave something creamy whenever I’ve been out in the cold for some reason!